Seymour works at a flower shop attending a plant he’s named Audrey after the girl he loves. But it’s no ordinary plant - it came from outer space and plans to rule the world. As things get out-of-control, can Seymour stop the plant, save the world AND get the girl? A tasty treat of musical theater! GARRETT WHITEHEAD (Seymour) is happy to return to his Plaza family. Garrett is a native of Cleburne, and holds his BA in Musical Theatre from Ouachita Baptist University. Recent credits include Pippin in PIPPIN, and Bernardo in SHAKESPEARE'S HAMLET at Arkansas Shakespeare Theatre; Barnaby in HELLO, DOLLY!, and George in THE DROWSY CHAPERONE at OBU. He would like to thank the entire cast and crew for their wonderful collaboration. "Support the arts!" EMILY WARWICK (Chiffon) This is Emily's 15th production here at PlazaCo! We so glad to have her back. You may remember her in past shows such as, Mrs. Mayor in this summer production of SEUSSICAL, Antonia in MAN...LA MANCHA, Mrs. McAfee in BYE BYE BIRDIE, Sarah Brown in GUYS AND DOLLS, or in RAGTIME, FOOTLOOSE, DROWSY CHAPERONE, FIDDLER, ANNIE or TREASURE ISLAND. She would like to thank her family, and friends. STACEY GREENAWALT (Ronette) Stacey is a theatre and choral nerd who's been singing and performing for thirty years on various stages: cedar chests, school cafeterias, backyard monkey bars, gymnasiums, football fields, churches, auditoriums, showers, and... well, theatres. Favorite roles include Lotty Wilton in ENCHANTED APRIL, The Detective in CLUE THE MUSICAL, Jolene in DIRTY ROTTEN SCOUNDRELS, Clairee in STEEL MAGNOLIAS, and both Yente and Fruma-Sarah in two different productions of FIDDLER ON THE ROOF. She's a 2014 Column Award nominee for her costuming, and most recently worked on FATHER OF THE BRIDE at PTC. When she's not costuming, rehearsing, performing, or hanging with her very talented friends, Stacey is a busy Supported Employment Specialist with Goodwill. She's also an accomplished artist, professional photographer, published author, mom, and shower show-tune diva extraordinaire. Big hugs to LA, ME, JM, JK, and Dizzle (love you guys!). CAITLAN LEBLO (Crystal) Caitlan is thrilled to be back on the Plaza Theatre Co. stage for her ninth production! Some of her favorite roles at PTC include, Narrator in JOSEPH…DREAMCOAT, Irene/Follies Girl in CRAZY FOR YOU, Heidi in [title of show], Rose in BYE, BYE BIRDIE, and most recently Marge in BREAKING...TO DO. Caitlan has also performed with the Granbury Theatre Company in GODSPELL, A CHRISTMAS CAROL (Mrs. Cratchitt), and LITTLE WOMEN (Marmee). Other favorite roles include Sour Kangaroo (SEUSSICAL), Mme. Dubonet (THE BOYFRIEND), and Muzzy (THOROUGHLY...MILLIE). She was a member of Kids Who Care for 5 years and performed with them at Disney World and off - Broadway. Caitlan graduated from TCU with a Bachelor's degree in education. She sang with the TCU Concert Chorale and performed with them at Carnegie Hall in New York City. Caitlan teaches theatre arts at Granbury Middle School. She would like to thank her wonderful husband, Josh, for always supporting her and sharing the stage and her crazy theatre bug! G. AARON SILER (The Voice of Audrey II) Aaron is one of the four founding producers of Plaza Theatre Company and has performed in many different shows here such as Tevye in FIDDLER ON THE ROOF, Nicely Nicely Johnson in GUYS AND DOLLS, Horton in SEUSSICAL, Charlie Brown in GOOD MAN...CHARLIE BROWN, Buffalo Bill in ANNIE GET YOUR GUN, and many more. Aaron has also won multiple Column Awards for Best Actor in a Musical, Best Director, Best Scenic Design, and Best Sound Design, and the Rudy Seppy Volunteer Award. Aaron is a proud father of three wonderful kids and husband to Milette Siler. JOSH LEBLO (Orin, Bernstein, Luce, Snip and Everyone Else) Josh is excited to return to the Plaza Theatre Co. stage for his seventh show! Some of his favorite roles at PTC include Gabe in BREAKING...TOD DO, Albert in BYE, BYE BIRDIE, a quick step-in run as a gangster in DROWSY CHAPERONE, Bert Healy in ANNIE, Mingo in CRAZY FOR YOU and Levi in JOSEPH...DREAMCOAT. Josh has also performed with Granbury Theatre Co. John the Baptist/Judah in GODSPELL, Charles Dickens in A CHRISTMAS CAROL, and Professor Bhaer in LITTLE WOMEN with GTC. Other shows include OKLAHOMA!, NO, NO NANETTE, and WIZARD OF OZ at Birdville HS, as well as THE BEST CHRISTMAS PAGEANT EVER, GET FOUND KID, and CHOICES at the Scott Theatre. He was a member of Kids Who Care for two years and performed with them off-Broadway. He would like to thank God and his loving wife for always believing in him. JAY LEWIS (Mr. Mushnik) JAY is honored to be performing in his 25th Plaza show. His most recent endeavors have included Prof. Callahan in Granbury's LEGALLY BLONDE, directing the critically acclaimed TITANIC, THE MUSICAL for Cleburne's Carnegie Players, Mr. Arnott in ENCHANTED APRIL and Hucklbee in THE FANTASTICKS. Favorite roles include Tevye, FIDDLER ON THE ROOF; Rev. Moore, FOOTLOOSE; Arthur, CAMELOT; Horace VanderGelder, HELLO DOLLY; Daddy Warbucks, ANNIE; and Ben Franklin, 1776. Jay is the principal at Crosstimbers Academy, a 9-12 charter school in Weatherford. Kisses, a dozen roses and a standing ovation for his supporting wife, Shauna. CLYDE BERRY (Audrey II (Manipulation)) is happy to return to the Plaza stage after taking time off to finish a college degree. Thanks to Dennis, Kristin, Cessany, and David for their leadership and support, and JTAM for always being awesome in general. Clyde will be directing LITTLE WOMEN this summer for PTC. 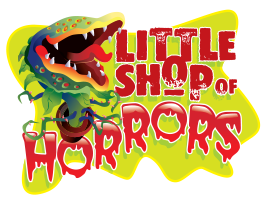 DASHIELL SCOTT MADDOX (Audrey II (Manipulation)) Dash is ecstatic to be in his first production at Plaza Theatre Company. He currently lives in Cleburne and graduated in Cleburne High School where he enjoyed being in school productions where he performed in THE LEGEND OF SLEEPY HOLLOW as Brom Bones, ALICE IN WONDERLAND, and INSANITY OF MARY GERARD. "Shout out to my home boy Jesse B. for getting me involved." MICHAEL SORTER (Ensemble/Audrey II (Manipulation)) Michael is a senior at the Fort Worth Academy of Fine Arts (FWAFA) and is excited to be in his 8th show on the Plaza stage. Some of his previous shows include DEAR RUTH, CAMELOT, RAGTIME, and most recently FATHER OF THE BRIDE; all at Plazaco. Some of Michael's other credits include Kyle in LEGALLY BLONDE: THE MUSICAL at FWAFA, Joe Stoddard in OUR TOWN at FWAFA, and General Lord Glossop in JEKYLL & HYDE: THE MUSICAL in Casa Mañana's Apprentice Program. "Thanks to all my friends and family for supporting me and always pushing me to do better!" CAT KARLIN (Skid Row Occupant/Ensemble) Cat is 16 years of age and Is super excited to be back on the Plaza stage. This is her 3rd show at PlazaCo. You might remember her from the ensemble cast in BYE BYE BIRDIE or SEUSSICAL. JAY A. CORNILS (Skid Row Occupant/Ensemble) Jay is returning to the Plaza stage after a short hiatus to appear as Captain EJ Smith in the Greater Cleburne Carnegie Players critically acclaimed production of TITANIC – THE MUSICAL, and as Basil Thorpe in IS HE DEAD at the newly renovated Granbury Opera House. Since moving to Texas in 2004, Jay has appeared in over forty-fifty shows, most of which have been here with the Plaza Theatre Company in Cleburne. His most recent roll was as Merlin in PTC’s production of CAMELOT. Jay has two published novels available online at crossoflorraine.com and litofangels.com. Jay lives in Cleburne with the greatest blessing of his life, his lovely and supportive wife Corlis. JESSE BOWRON (Skid Row Occupant/Ensemble/Puppeteer cover) Jesse is very excited to be returning to the Plaza stage for his fifth show. His previous roles being Hugo Peabody in BYE BYE BIRDIE, Sgt. Chuck in DEAR RUTH, Sir Lionel in CAMELOT and more. Jesse first began performing at the age of 12 with his church drama and dance team, Consuming Fire Drama Team; he then began taking acting classes at TAFA and is now going to college majoring in Theatre Arts. Jesse also creates various videos on his YouTube channel, MisterJesseNickell. Jesse would like to thank God and all who have encouraged and mentored him through his journey as an actor, and also Johnny Depp. CESSANY FORD (Stage Manager) Cessany Ford is excited to be Stage Managing her 423 show here at Plaza Theatre. She has recently discovered her new found love of hamsters and emus. She has decided to start her own Emu farm on the outskirts of Fort Worth and looks forward to racing them in a special stockyard show. Cessany Ford also wants to express her love of skipping through fields of wheat and basking on a rock in the dessert sun. DAVID GOZA (Asst. Stage Manager) David Goza is excited to be working his first show as an assistant stage manager for Plaza Theatre. He has been working closely with Cessany Ford (And he means that he has done ALL of the work himself), to learn the ins and outs. David truly believes Walt Disney is still alive and well, and that he was Long John Silver in a past life. He likes to spend his free time by going to local theaters and heckling fellow audience members as if he were Statler of the Muppets. If you are looking for party entertainment this Christmas season, David does a killer "Marley and Marley" from A Muppet Christmas Carol. This will be his 9th show at Plaza and is very excited to be working here again. TABITHA BARRUS (Choreographer) Tabi is so happy to have had the opportunity to work with this fantastic cast and crew. Tabitha teaches drama at James Madison Christian Academy as well as teaching every afternoon at Plaza Academy. She feels so lucky to do what she loves! Favorite choreography credits include FOOTLOOSE, FIDDLER ON THE ROOF, A CHRISTMAS CAROL, HIGH SCHOOL MUSICAL and column award nominated choreography for JOSEPH... DREAMCOAT. She sends love as always to Mom, Dad, Park, Cam, E, Mimi, JJ, and Dodger for believing in her, and a shoutout to the cast for making her stuff look so good.